Summer Training: Workshop, Intensive or Camp? Summer programs come in many varieties for all sorts of dancers, but they can usually be categorized as one of three types: intensive, workshop or camp. What defines each? Let’s take a look at each type of program. Camps – Dance camps usually accept a range of abilites and experience levels and offer classes geared less to professional aspirants and more to those interested in dance to expand their life experience and for the sheer joy of it. The focus is usually on improving technique with a few classes a day while leaving time for lots of fun activities and events for socializing and enjoying the summer. These programs can be as short as one week or as long as all summer. Examples of dance camps include Just for Kix Summer Dance Camps, Brant Lake Dance Camp and American Dance Training Camps. Workshops -Workshops can have the same daily intensity as intensives, but they usually last just 1-2 weeks. Workshops often take place in university settings, regional schools or as add-ons to summer intensives. For commerical dancers and students working towards high-level versatility, putting together a workshop tour of multiple programs that span the summer is a great tool for training. Some workshops are dedicated exclusively to younger dancers or for choreographic experimentation. Examples of workshops include the Broadway Dance Center Summer Workshop Series, the Florida State University Summer Intensive Dance Workshop, the Regional Dance America National Choreography Intensive and the School of American Ballet’s Los Angeles Workshop for Young Dancers. Intensives – Summer intensives (or SIs for short) are designed for professionally-oriented students and generally consist of 4-6 weeks of all-day lessons. They can be competitive and are usually associated with professional companies or residency conservatories. SIs may be based off of regional, national or international programs. Examples are the Boston Ballet School Summer Dance Program, the University of North Carolina Summer Intensive, the Harid Conservatory Summer School and the School of American Ballet Summer Course. Any of these types of summer programs may offer guest teachers for a few days or weeks out of the program. If you are looking for an intensive, notice that the presence of the word “intensive” does not necessarily mean that the program falls within the above guidelines. On the other hand, true intensive programs may choose not to use the word “intensive” in their title. Take the time to look closely at the daily schedule, faculty and duration of each program to decide where each program falls. How can you decide what type is right for you? That depends on many factors, including your available funds and scholarships, your dance goals and the specifics of the program’s training schedule and faculty. 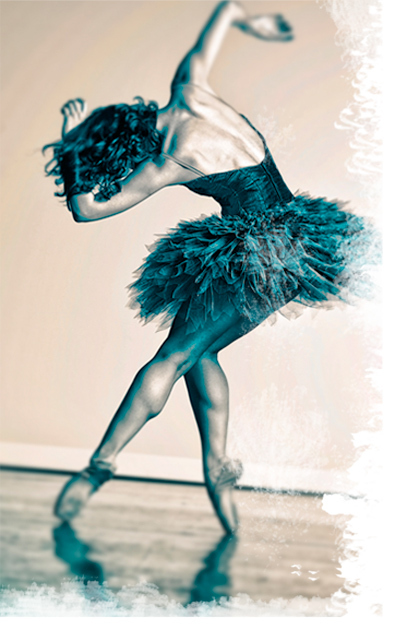 Make a list and consider your realistic goals and desires in dance. At the higher levels, an audition will certainly be in order, which could possibly limit your options. Don’t assume that higher level programs are beyond your reach financially – I’ve seen many high quality intensives that cost the same as some smaller workshops. But note that the quality of one is not necessarily higher than the other based on cost, size or other single factors. There are tons of options out there, and I’m sure you already have ideas about what’s ideal for you. If you’re heading to a summer program right now, think about your experience so you can decide if the program worked well for you. Think about what you want next year. There are tons of options out there, and there really is something for everyone. You have the power of choice, so exercise it! Partnering in ballet is one of the most exciting classes for many students – but it can be a little intimidating for sure. Students in local schools often find that their partnering opportunities are limited to conventions, rehearsals for specific shows and summer programs. For students seriously interested in ballet who do not have much access to partnering during the year, I encourage attendance at an SI where it’s offered three times per week or daily. (Some otherwise good programs offer it only once or twice a week – or not at all.) When its time to actually take the classes though, the initial excitement may morph into anxiety. What will pas de deux work be like? What if I mess up or can’t do what is asked? What if I don’t like my partner or he doesn’t like me? What if I do like him? I promise you that you’re not the only one who feels this way. At many SIs, the majority of female dancers you are with will not have much partnering experience. And trust me, the guys are nervous too – they feel a lot of pressure to “be there” for the girls, and the less experienced ones may be very intimidated by those high expectations. Not to mention that they too have worries about getting steps right and getting along with their partners. Everyone is feeling pressure and nerves, but good pas teachers will do a few things to ease the tension for both sides. First off, the pairing up will start the class. As you get more advanced, teachers may ask students to pair up on their own, but in the beginning and intermediate levels, the accepted practice is to line up the men and women separately by height and set pairs that match in stature. Some men may be asked to take more than one partner and execute each combination once for each girl. Partnerships might be set for the day, the week or the whole summer program. In order to get the students comfortable with each other and to ease the tension, the teacher will usually start off with some very basic and often fun trust exercises. (This may be the case even with more advanced classes who are working with new partners.) These should also help both the women and the men feel comfortable with where the guy’s hands will be on the girl’s torso and extremeties. This is often done in a humorous, fun way, and you’ll have an opportunity to get to know each other better, experiment with the exercises and laugh-away some of that initial awkwardness. From there, exercises will progress slowly with some basic hand-held walks and supported bourees. You might feel like these exercises are not what you came for, but as they say: you have to walk before you can run -or be spun and lifted! So don’t be dissappointed if you aren’t whirled around above the guys head in the first 15 minutes. Trust me that you will greatly benefit from mastering these nuanced exercises. And I think you’ll find that holding an audience rapt while gracefully walking across the stage and maintaining a connection with your partner is much harder than it looks. Combinations will gradually add difficulty, with supported bourrees becoming preparations for supported pirouettes. Walking hand in hand across the floor may evolve into walking into a supported pique arabesque, which may in turn become a supported promenade. Jumps will start with basic entrechats in place and develop into well-coordinated lifts with running preparations. Before you know it, you will be pulling off multiple pirouettes, finger turns and a variety of fun, basic lifts. All in a day’s work for a dancer, right? By the end of the summer, you may be able to try your hand at some more intricate combinations and harder lifts or perhaps a small piece of classical grand pas choreography. Dance Spirit recently published an excellent article with a collection of the best tips for partnering newbies from established principal dancers. I am loving this article because it gets down to the nitty-gritty of exactly what it’s like to deal with real-life partnering complications like accidentally hitting your partner and the difficulty of attempting to act as if you’re in love with a guy you barely know! Even many advanced students could stand to learn something from reading it; I remember a lot of women in my advanced classes who just loved to wear those tie-skirts with the ribbons out – not a good idea. So check it out for more details on what partnering class are really like and lots of do’s and don’t’s so you can be totally prepared, calm and collected when you get paired with that cute guy from Iowa for the summer! Ms. Flack was open to the press about having tough time departing from NYCB a couple years ago, as she was included in the controversial layoffs of early 2009. I could not be happier to see that she has made it through that transition and is fostering her creativity in new ways! Swan Lake Samba Girl Tonya Plank was on location at a recent book signing with Flack, where long lines of blossoming balletomanes created an atmosphere of excitement. Check out her report on the event, and pre-order or pick up a copy of Bunheads through Amazon, GoodReads or select bookstores! That’s right, birdies, you can now follow me for musings, posts and all the ballerina-in-training news that’s fit to tweet! Check out the instant feed at right and click the “Follow Me” button below it to get in the loop.